Winter is over, and Misfit is prepping for the warmer season with a host of new looks for its Shine 2, Ray and Phase trackers. The Shine 2 is getting a couple of elegant bands called the Halo Bracelet, which doesn't bear too much of a resemblance to the similarly named Halo Necklace. The thin leather straps feature stainless steel buckles for extra glam, and it'll arrive 18 April in three colors for $49. The Ray is also going high end, but with metal Ray Bangles and metal mesh Ray Mesh Bracelets. The Ray Bangles will give you a new way to buye the Misfit Ray in three colors - gold, silver and rose gold - for $119 while the Ray Mesh Bracelets will be available separately in the same colors for $49. The Ray will also come with four new sport band colors - green, blue, stone and pink - for $99 and have a new Ibiza Sport Band three-pack and Havana Paracord three-pack available for purchase separately, at $29 a piece. While the Ray Bangle and Ray Mesh Bracelets will arrive this summer, the new three-packs and the blue sport band will arrive on 18 April, while the green, pink and stone will arrive on 25 March. Finally, the Phase is going to arrive in four new colorways: brown leather band with a black face, pink sport band with a gold face, green sport band with a stone face and black sport band with a black face. 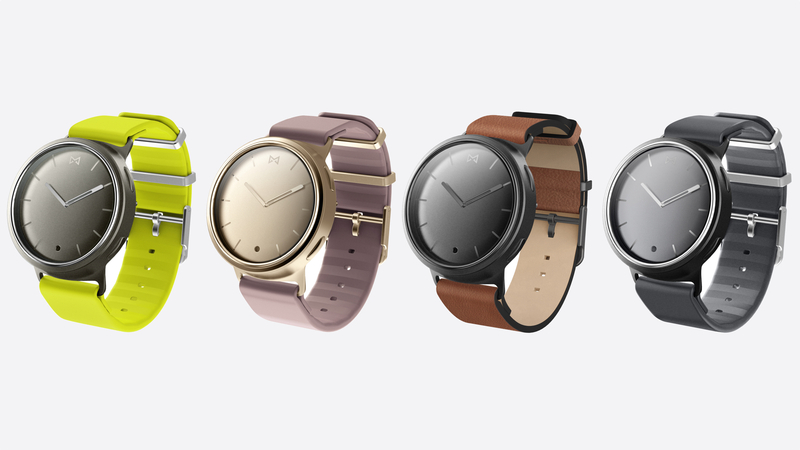 Those will be available in April, with the brown leather Phase costing $169 and the sport band options at $149. The news from Baselworld 2017 doesn't stop there. Misfit has also announced that its upcoming Misfit Vapor smartwatch will come running Android Wear 2.0 when it arrives late summer, not the proprietary OS we saw it running on back at CES.